Beyond the immediate chaos and destruction of mass inundation, floods bring a host of other hazards. The greatest impact to water supplies are the disruption of water purification and sewage disposal systems, overflowing of toxic waste sites, and the dislodgment of chemicals previously stored above ground. Such challenges persist in the wake of hurricanes Harvey and Irma, which devastated much of the southeastern United States. Widespread flooding from these storms is estimated to have displaced more than one million people, with certain areas getting hit by as much as 51.8 inches of water. The damage is not limited to the obvious human and economic impacts. Floodwater may be (and often is) dangerously contaminated with a toxic stew of chemicals and bacteria. For example, in Hurricane Harvey’s floodwaters, E. coli was found in standing water at levels 135 times higher than what is considered safe, alongside elevated levels of lead, arsenic, and other heavy metals. While suspended sewage and oil slicks are clear indications of contamination, it is always safest to assume that floodwater is contaminated no matter what it looks like. Drinking water wells can become contaminated from inundation of water laced with toxins, chemicals, septic seepage, and municipal sewage. A major risk with floodwater is its potential to harbor bacteria from damaged sewage infrastructure (including septic tanks) that might infect people with dangerous diseases. Common pathogens and viruses include E. coli, salmonella, hepatitis A, typhoid, and tetanus. Coastal flooding with an influx of ocean water may also bring diseases like Vibrio–a highly dangerous “flesh-eating” diseasecontracted by several people following Hurricane Katrina. In addition to pathogens and viruses, agricultural and industrial chemicals can be swept up into the floodwater mix by traveling over fields and streets. While direct contact with floodwater will put you at the highest health risk, this toxic floodwater mix threatens drinking water supplies (surface water and groundwater). Concern is particularly high for homeowners with private wells–whose drinking water wells are at risk of mixing with contaminated floodwater. Swiftly moving floods carry debris that can dislodge well hardware, allowing contaminated water and sediment to enter into your well system. This can even lead to a total collapse of your well. As private well contamination is not monitored by the government, residents are usually left to fend for themselves. Additionally, persistently wet environments are ideal for toxic mold growth, which can develop in just a matter of days. It is crucial to test your home for mold if you’ve experienced flooding at home. 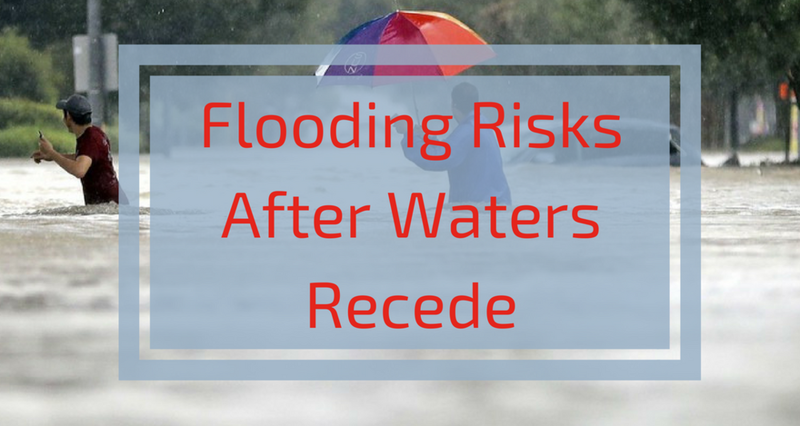 While the risks of floodwater are significant, there are also simple precautions you can take to protect yourself. The Center for Disease Control (CDC) advises that if you are in a flooded area, you should avoid or limit direct contact with contaminated water. Additionally, it is critical that you see a doctor about cuts, open wounds, and all symptoms of illness. The CDC recommends that you bring water to a rolling boil for at least one minute in order to kill major waterborne pathogens before using potentially-contaminated tap water. Of course, boiling water will not reduce the risk of water contamination from heavy metals (in fact, it will concentrate them!). According to professor Rachel Noble, "As long as people are not eating and drinking items that have been in floodwater...they should be okay with washing hands and regular hygiene.” It is essential, though, to know if your tap water source is contaminated. If you are concerned that your private well has been contaminated with floodwater and are not sure what to do, we can help. Our Tap Score home water-testing kit tests for over 100 contaminants. It is easy to use and we provide you with a personalized water quality report, complete with actionable recommendations. Older PostWhy Do U.S. Water Systems Add Fluoride to Public Water Supplies?